Following a devastating reversal Monday of a nearly $34.8 million class-action ruling against the Hartford in a Connecticut Supreme Court decision that seemed to miss the spirit of state law, the plaintiff collision repairers are left with few options despite years of victories in the case. He called it “confounding” that the Supreme Court would 12 years later throw out both a jury verdict and a lengthy opinion by a “very smart” judge in Artie’s Auto Body et al v. the Hartford Fire Insurance Company following the Hartford’s appeal. The only options left seem to be for the shops to get the law changed (which still leaves the collision repairers without the approximately $34.77 million in damages) to spell out precisely what appraisers can and can’t do or to try and appeal to the U.S. Supreme Court. The latter is a very, very long shot, particularly as the case didn’t turn on any federal law. “It’s just terribly disappointing,” Slossberg said. The case hinged on whether the state’s appraisers working for Hartford could use the prevailing rate demanded by insurers — who had allegedly used their dominance of the auto body business model to artificially lower it to direct repair program levels — in their estimates. Connecticut state law requires licensed appraisers to be impartial. The state insurance department later “assured him that he could continue using the prevailing rate when negotiating on behalf of the defendant,” the court wrote. The agency has continued to take the stance that rates aren’t subject to the bias restrictions in the law governing appraisers. As the Supreme Court ruled, this is correct under the letter of the law; rates aren’t discussed in the regulation. However, this seems to create a spirit-of-the-law paradox: It’s not OK to appraise the damage the way the insurer wants, but it is OK to use whatever rate they want. There’s also a letter-of-the-law question of why “appraisal of damaged property” would exclude the labor rate cost part of the estimate. The court also took the short-term position that shops should just refuse work for which they’d receive too little pay and cheaper shops mean cheaper insurance. This misses the long-term implications of why shops feel they’re worth more (training and equipment, for example) and what such businesses turning away work means for their survival as well as customer safety. Though the law relates to the appraisers, Superior Court Judge Trial Referee Alfred Jennings noted in the reversed opinion that Hartford’s asking them to use certain rates was a “penumbra,” which he said had been defined as “a vague, indefinite, or borderline area” of the law. 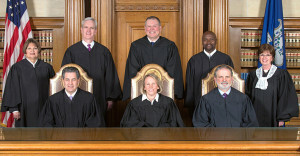 What that meant, according to the jury and Jennings, was that allegedly pressuring someone to break a law “offends public policy as it has been established by statutes, the common law or other established concept of unfairness” and so the Hartford was liable under the Connecticut Unfair Trade Practices Act. The collision repairers attacked the insurance agency’s letters as not having the legal weight necessary to be considered, but the Supreme Court said they’d failed to show why the documents were actually wrong. As the (insurance) commissioner cogently explained in his 2007 and 2008 letters to the attorney general on the subject, there is a perfectly logical and reasonable way to reconcile the defendant’s right to negotiate labor costs with the appraiser’s ethical duty to ‘‘disregard any efforts on the part of others to influence his judgment in the interest of the parties involved’’ … and that is to recognize that the appraiser’s role is limited to an assessment of the auto parts in need of repair and the number of hours to complete the auto body repair job, whereas the rate that an auto body repair shop is to be paid is the subject of negotiation between the insurer and the shop, with the appraiser sometimes acting as a negotiator on behalf of his or her employer, the insurer. There is nothing about this division of authority that is suspect or unfair, or that otherwise contravenes the requirement of that appraisers conduct themselves in an upstanding and independent manner. This misses another “perfectly logical and reasonable way”: Let appraisers assess only parts and hours and don’t let them serve as a negotiator for an insurer who’s paying them — particularly if the court agrees with Sullivan that appraisers aren’t qualified to judge rates, only damage and repair time.